It’s Sunday fun-day (as well as the first night of Hanukkah for some of you) and we have some awesome treats for you! To celebrate WordPress holiday cheer we wanted to share some of our favorite FREE holiday resources that you can use to make your website more festive. Checkout the freebies below and grab a few to get your readers & followers into the holiday spirit! Nothing says “holiday season” like falling snow on your WordPress blog! There are plenty of ways to add snow to your site, but I like to keep things simple so here are the easiest ways to add snow to your site with plugins (of course)! Yes, the mega-plugin Jetpack does in fact already have snow built-in. If you already have Jetpack installed just log into your WordPress installation, click on Settings > General and check the box to “Show falling snow on my blog until January 4th.” That’s it! And it has the added bonus of removing itself after a reasonable amount of time. You can also stack Jetpack Holiday Snow with the free Snow Opt-in plugin. This little plugin adds a little snowflake icon that users have to click on to “opt-in” for holiday snow (because let’s be honest, some people are grinches and don’t want to see snow on every page of your blog). Want custom snow to drift down your posts? 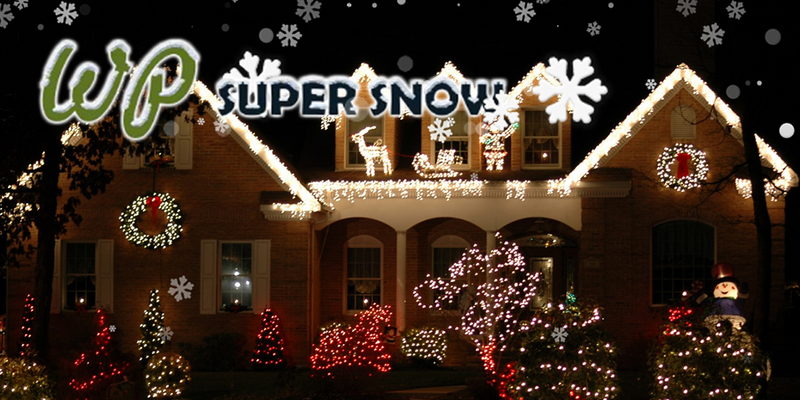 Try the free WP Super Snow WordPress plugin. What makes this plugin better than the rest? All the great options! You can use the included Virtual Snow Blower to set custom variables for your snow container (you can target the entire body, or just your header, or any other page element), z-index (the z-index can be used to have snowflakes falling in front of or behind any page element – the highest z-index is shown on top) and even images (yup – you can add any image for your snowflakes). And with the Forecasting/Condition section you can specify which pages display your snow, and if you want it shown on mobile devices. One way to keep your excitement in check is to keep track of the days left until the big day! And these hand free plugins are easy ways to add countdown trackers for holidays, celebrations or anything else. Have a look! Use the POWr Holiday Countdown to create customized countdown timer on your site. The best part about this plugin? It comes with built-in support for translations! Plus the countdown comes with additional options for backgrounds, colors and fonts. The Christmas Countdown Widget is a cute little plugin that adds a Santa Claus countdown widget to your site. All you need to do is add it to a widget area. The counter will automatically reset after Christmas and begin it’s countdown all over again each year. Let your readers know how much you appreciate them with a card! The following free plugins make it easy to add popup messages for your readers. Add colors, text and even images! The DW PopUp plugin makes it easy to add a custom card for your readers. Just enable the plugin, add your card text and choose your settings. This plugin includes options for a snow effect, font size, colors and more. It’s a fun and easy way to say thanks or share a holiday discount. To add a popup message to your website for the holidays you could also try the free Holiday Message plugin. This cool plugin ha options for adding a graphic, counter, custom message and colors. This is a fun way to share news & cheer all winter long! Want to really go the extra mile? Checkout these fun Christmas plugins that will take your holiday cheeriness to the next level. Share your cheery mood by adding festive tunes to your website. The free Christmas Music plugin will play Jingle Bells on your website. You’ll have the option to play the music on all page or just on a specific page, post or custom post type. The las plugin we wanted to share is the Random Christmas Fact Widget. It really serves no other purpose than to share joy with your readers. The widget randomly displays one of 40 Christmas facts to your readers (for example, did you know that “Rudolf” was created by the department store Montgomery Ward for a 1930s promotion – well now you do). That’s it for today! Hopefully you’ll try one of our holiday favorites to add a little something extra to your website this holiday season. And if you have any other free holiday tools or resources for WordPress share them with us in the comments below! We’d love to hear about them! Automating Your Social Media Accounts For Your WordPress Site – All in One Go!